Brady Vilcan, a 36-year-old pharmacist from Houma, LA, was sent home last night. The Biggest Loser was really great last night because they brought back all the contestants who had previously been sent home (except Coleen's dad, Jerry). These contestants all competed for a spot to stay on the ranch for at least one more week. The contestants had to go up and down a step until someone reached 1000 steps. It was an exciting challenge. I was yelling at the TV, "Go Stacey, GO!!! Girl Power, Girl Power, Girl Power!" She almost won, but Ed beat her out. Ed's wife, Heba was elated of course. Once Ed won the challenge, he joined the blue team members (Ed, Heba, Brady, Vicky, and Amy C). 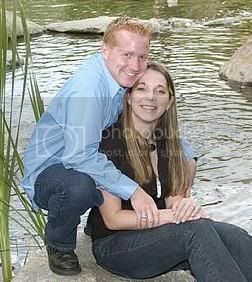 At the beginning of the season, Brady and his wife, Vicky, formed an alliance with Ed and his wife, Heba. 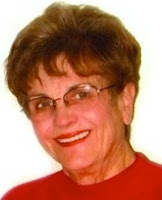 Because of this tight alliance, Amy C. was in a vulnerable position. Her situation became even more precarious once Ed was reunited with the blue team. After the weigh-in, Brady and Michelle dropped below the yellow line (they both lost the least amount of weight - with Brady losing the least: six pounds). Normally, the contestants are given time to discuss with one other who they want to send home, but in this case, after the weigh-in, they were brought into a room and instructed to vote immediately. The three black team members (Renee, Michelle, and Coleen) naturally voted to send Brady home. The blue team alliance members (Brady, Vicky, Ed, and Heba) voted to send Michelle home. Breaking ranks (saying it was time to look out for herself for a change), Amy C. voted to send Brady home (yea Amy!) which made it a tie between Brady and Michelle. Since Brady lost the least amount of weight, he had to leave the ranch. I didn't have a problem with Brady (though his cockiness was a bit annoying) but his wife - oh my goodness - where to start! Vicky is downright hateful. I truly hope she doesn't become The Biggest Loser. What a bummer that would be. 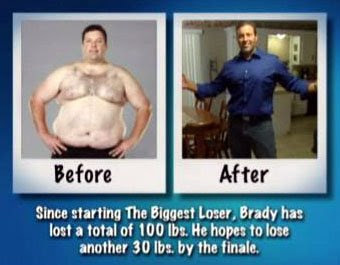 Brady started The Biggest Loser weighing 341 pounds. Eight weeks later and 77 pounds lighter, he left the show weighing 264 pounds. As of the filming of Brady's "Where Are They Now?" video, he has lost a total of 100 pounds! He hopes to lose another 30 pounds before the show's finale. Upon arriving at the ranch, I wore a size 48 pants with a big gut hanging over the top of them. Now I'm happy to say that today, I wear a size 34 waist pants. Looking back at the old Brady makes me feel like, "What the hell was I thinking?" I mean, you got two very young children, one of whom is heading down the same lifestyle path that her mom and I were both on. In the past, their old dad would use food as rewards for everything. They bring home an A on their report card or something - "Hey, let's get pizza! ", "Let's go out and get ice cream with extra fudge on it! Hey, you know, dad will have a bit of that too." One of the great things that we've started implementing was biking down to the local market. You know, I let them (daughter-Lucy and son-Chance) start picking out what kind of fruits and vegetables they want to have for the week. I think the fact that they actually have a hand in choosing which vegetables and fruits they're getting for the week, makes them more apt to try things. Lucy: "My dad's trying to teach me to eat salads and stuff." I can finally give Lucy and Chance the father I've always wanted to be for them and never could. If interested, you can watch Brady and Vicky's profile video here. You can also watch Brady's "Where Are They Now?" video below or click it here. I was hoping his wife Vicky would be sent home because she is very, very mean and I do not like her. And now I saw the scenes from next week's show, and it looks like she is out to get Amy next week for voting against their alliance! Oh no! Daisy - Vicky is the DEVIL! Just kidding, but she is dreadful. I saw the preview too and boy oh boy is it gonna get ugly! Vicky is a horrible, terrible, nasty person! I hope she has a terrible week and goes home next Tuesday. She's pure evil! And from the previews for next week it looks like she's about to get worse. Gah!!! I'd love any of the black team or Amy C to make it...but Vicky, Ed, Heba...please go home and stop being so hateful!!! He has definitely done a lot and looks very good. I haven't been keeping up with every episode this season but I don't like his wife either. Natalie - Girl, I couldn't agree more with you! She is awful, awful, AWFUL! Of course, the producers of The Biggest Loser knew that when they chose her to be on the show. They want drama. MySweetThree - I hope Vicky is sent packing next week too! Angel - I agree, Brady looks great!